L. Septimius Geta, the younger son of Septimius Severus and Julia Domna, was born at Rome in A.D. 189. In 198, he was given the title of Caesar at the same time as his brother Caracalla was raised to the rank of Caesar. Geta was murdered in February, A.D 212 by his jealous brother. 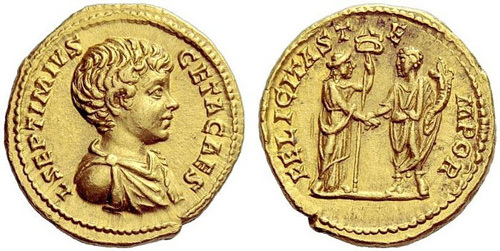 Obverse: L SEPTIMIVS GETA CAES, Bust, draped, head bare, right. Reverse: FELICITAS TEMPOR, Felicitas standing right, holding caduceus and clasping hands with Geta standing left, holding cornucopiae. Reverse: SEVERI PII AVG FIL, Knife, sprinkler, ewer, lituus and simpulum. Obverse: P SEPT GETA CAES PONT, Bust, draped, cuirassed, head bare, right. Reverse: CONCORDIAE AETERNAE, Jugate busts to right of Severus, radiate and draped, and Julia Domna, diademed, draped and resting on a crescent. Reverse: FELICITAS PVBLICA, Felicitas standing left, holding caduceus and cornucopiae.